Social media is not just about collecting followers or meeting a quota; it’s about strengthening your brand and more importantly, telling your story. With 1.65 billion active mobile social accounts globally and 1 million new active mobile social users added every day, having a measurable plan in place increases engagement and builds trust in your brand. Majority of marketers who invest in developing a strong social media strategy have higher exposure amongst their audience than those not on social media. At WCM, we believe in taking an integrated approach to building strategy for social media because. Here how you get started on the right track. What is the point of your social media presence? Determining your end goal, for instance, whether you are trying to build awareness of a product or garner support for a cause, is the first step in the right direction. This may require you to connect with influencers in your industry or change the type and frequency of your posts. Setting goals helps define an editorial strategy, makes content production more fluid, and collecting metrics easier to measure. Once you’ve nailed down a goal, decide which platforms will help you achieve it. Every social media platform is different and every platform isn’t for every organization. You risk alienating certain demographics if you use them all and in the same manner. If your company targets an older demographic, then they are not likely to identify with a Snapchat-heavy social media campaign. Visual content works well on a photo-based platform like Instagram where majority of users are Millennials. If you’re reaching for an upper-middle, management audience, LinkedIn has more people in the 50-to-64 age bracket. Unlike a campaign with a set start and end date, social media requires ongoing care, collaboration, and attention. Identify how much time and manpower you have to execute your strategy. Save time where you can with pre-arranged media blasts to post for you. Tools like Buffer allow companies to schedule posts and track analytics. This frees up time for other things, like participating in Twitter Chats or writing new blog posts. It’s important to have a steady stream of original and shared content to hold your audience’s interest, or you’ll be grasping for something to post once you’ve exhausted the supply. Use an editorial calendar to schedule your content and get a sense of what you’re missing. Build a backlog for when you get busy or around the holidays. In the calendar, you should include the title, when you post it, hashtags you will use to promote it, and the social media promotion schedule. Statistics courtesy of The 2017 Video in Business Benchmarks infographic from Vidyard. Lastly, see how your output matches up with your goals. Metrics like the amount of engagement, number of followers or shares are helpful checkpoints. In a few months, if you are still falling short of your goals, try alternative writing styles, platforms, or content. Aimlessly tweeting won’t get you much. 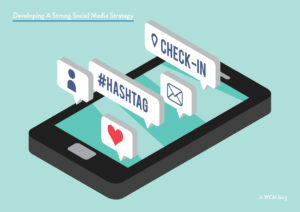 Failing to use social media for its intended purpose- to connect and be social- means you’re missing out on key conversations. Sit down with your team and define your strategy. Your business and your audience will thank you.